Left Brain Math — The left brain processes information in an analytical and sequential way. It looks at pieces first before putting them together to get the whole. Most Math subjects are taught this way. Right Brain Math — The right brain is visual and intuitive. It looks at the whole picture before processing the details. Right Brain Math uses graphic images and patterns, making it easier for young learners to understand. Mental Math — This involves computing for exact answers without the use of pen and paper, and other aids. This taps various Math methods such as Vedic Math, which even NASA is said to use. MATH-Inic complements the Mathematics curriculum currently being taught in schools. It encourages innovation and creativity in problem solving by making Math easy, fun, and enjoyable. With practice, students can perform lightning-fast calculations, improve performance during exams, and raise their grades. While it started as a series of courses for children, adults will also find MATH-Inic techniques useful in everyday life and situations. In both cases, learning MATH-Inic can raise self-esteem, and enhances brain power. MATH-Inic is also in line with Ike’s advocacy to help in nation-building. As a recipient of government subsidies and scholarships, he believes in giving back to the country. The mental exercises involved in MATH-Inic help enhance the mental aptitude, competence, and intelligence level of Filipino students and citizens. Because of the technological advancements in recent years, the current crop of students increasingly rely on their calculators, netbooks, computers, iPad tablets, and even cellular phones, to calculate numbers. This has virtually minimized or even eliminated the need for mental exercises that the brain sorely needs to maintain brain power. Through MATH-Inic, Ike and the rest of the MATH-Inic team hope to develope generations of Filipinos who can compete on all levels globally. 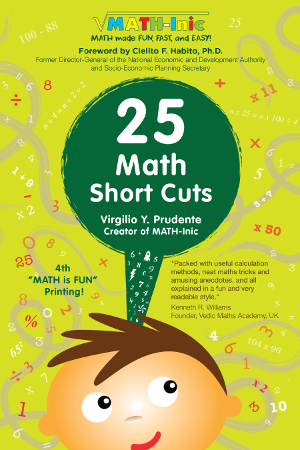 Get the free eBook preview of the bestselling book 25 Math Short Cuts: Practical Algebra "Tricks" for Everyday Use by Virgilio "Ike" Y. Prudente when you sign up for our mailing list. Learn useful Math shortcuts with the first 5 chapters of the book included in this preview. Thank You! Check your email inbox . Didn't get our email? Be sure to check your spam folder.